My Sheer Shirt Ebay Wishlist has some fantastic pieces today, I love and want them all! Sheer shirts are so beautiful and light and are great for layering up now it’s getting into autumn. These six shirts are a bargain, all under £20 including postage! Yes please! These shirts go perfectly with jeans or a tube skirt as well as making great work shirts with a pair of black trousers and some cute pumps or brogues. 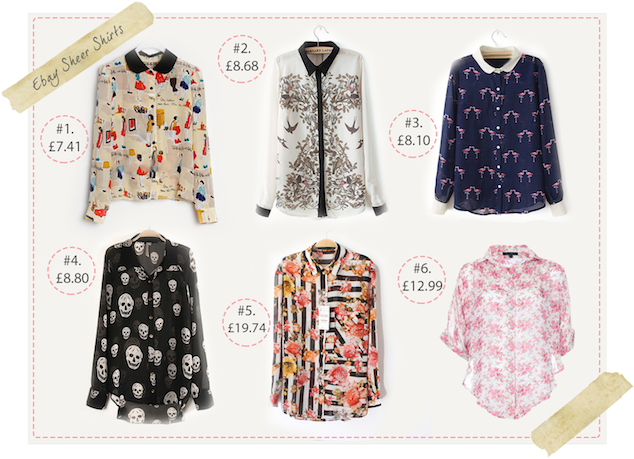 Let me know which your favourites are, mine is the Swallow monochrome shirt that’s only £8.68!